Accordez-Moi Paris, The Show ! Do you know the origin of the name “sapeurs pompiers “ (firemen in French)? Have you ever heard of the tragic fate of Castor and Pollux during the siege of Paris in 1870? Do you know what a “pauloise” medal is? 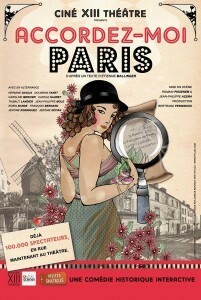 If you do not know the answer to any of these questions, these are all fun and historical anecdotes that you will understand after attending the show, Accordez-moi Paris, recently launched by the troupe of the Visites-Spectacles in the theatre Ciné XIII. Retracing the history of the underground cabaret, “the Turnips Field”, installed in the old quarries of Montmartre, we follow the funny investigation of a theatre troupe seeking to trace the events that led to the mysterious disappearance of the cabaret manager in the late 19th century. We enjoy the show from the comfort of the soft leather sofas of the Ciné XIII, a movie-theater that belongs to the film director Claude Lelouche (“A Man and A Woman”). The warm and friendly setting is in the style of the show, relaxed, if not slightly burlesque. Humor is indeed always present in the dialogues and actions, targeting all types of audiences, from the pure Parisians (like us at ParisByM) to tourists who wish to discover unknown aspects of Paris in a humorous way. The small team (4 players and 1 musician) really seemed to have fun on stage, happy to share their knowledge of Paris. During the show, the public is often called upon to help find the culprit of our investigation. And even if the outcome of the investigation doesn’t really depend on us, we still are delighted to have been able to participate. In short, let’s say it is a enjoyable experience that is both fun and informative. For whom? Everyone, provided you understand French. Tip: Before attending the show, briefly read about the French civil war called the “Commune de Paris”, which will help you understand the historical context. Cabaret Performance At The Moulin Rouge!